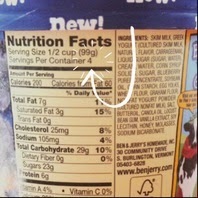 On food labels, the calories listed are only the calories per serving, in the box, bag, or in my case, carton. In high school, I would consume a pint of ice cream in one sitting and think it was only 200 calories because that’s what the nutritional facts said. Turns out it is 200 calories... times about 4. Now I am so aware of this that I rarely have ice cream, and the only two guys I am continually hiding from are Ben & Jerry. That the “spine” I thought my shrimp had is actually poop. Yup, no thanks, I’ll have chicken. The obvious one: that Santa Claus and the Tooth Fairy aren’t real. I mean, who doesn’t remember figuring that one out and being absolutely devastated?